Salon QP is now over for another year. This year, as I have already written, I was a little disappointed that neither Pinion or Schofield were exhibiting. However, now on my fourth year I am getting used to the format of the show and so I am starting to feeling comfortable in the Saatchi Gallery. One learning from last year was that around the show there are also some great presentations from interesting people in the industry. This year the talk that caught my eye was Robert Loomes discussing about how he got to be building his movements in Britain; held on Friday lunchtime. Robert is a super enthusiast who apparently would happily tell everyone about is journey for as long as they are prepared to listen. Salon QP disappointingly limited his time. Robert’s talk was not limited to his new movement, but his watchmaking history that lead up to this point. The key to his story would appear to be Roberts, “well, that should be possible” attitude mixed with a healthy dose of patriotism. To cut a long story short the whole enterprise started with a bet. Now this all seems like a recipe for the usual heroic “could have been, if only ” situation. The heroine in this story, as in so many, would appear to be Robert’s wife Robina, who in 2011 bought the business and left Robert to get on and do the technical stuff. Robina recognised one of the most important current marketing trends “localisation”, customers, a much better description than consumers, are paying more attention to the origin of the products they buy. This has become very evident in the world of food and drink but is now moving into more durable items such as clothing and of more interest to us, watches. Watches that are now, from a practical point of view redundant, have become more personal statements leading more people wanting to know more about the story and origins of the product the are buying to make that statement. 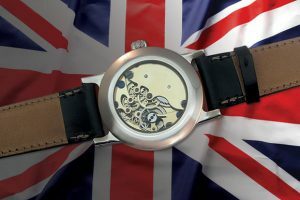 For many people that includes wanting to support their national industry or even to go as far as wanting to know the people responsible for making their watch. These are the people Robert and Robina sell there watches to. In making their new “Stamford” watch Robert and his team have built on they experience of making the Robin watch using modified NOS Smiths movements. The Stamford being a development of that movement in a case and dial similar to to the Robin. Initially only 24 examples will be made 12 in gold and 12 white gold and maybe one for Robert himself in “stainless gold”. Unfortunately, for those of us with other demands on our salary, the price will be £28,500. I did enquire if there was a chance these prices might drop if production increases and bring economies of scale. The message from was fairly unambiguous from Robert, unlikely. Given the small number of all the components they are are ordering from small local engineering companies it is difficult to lower cost significantly. Having said all of this I am confident that Robert and Robina will find 24 buyers that believe in their idea of localisation. Congratulations.